Vision and Purpose - SparkFire, Inc. Innovation is now the driving force in virtually all industries. It generates a landscape that’s ever-changing and difficult to navigate — unless you have a clear, purpose-driven vision. Together, we’ll illuminate that vision — the guiding light that reveals your clear path to success. Our process takes your team on an in-depth journey of discovery, exploring your core purpose, values, target, competition, and brand personality. We identify strengths and opportunities, uncover amazing insights, and pinpoint what drives you forward. Then we craft a vivid and meaningful vision statement that’ll inspire you to move in innovative new ways. Check out a few of our visionary clients. SparkFire helped put our company on the fast track to growth. Together we created a clear company vision, plus product development and marketing strategies that set the course for the future. We crafted a clear brand architecture and powerful brand positioning. 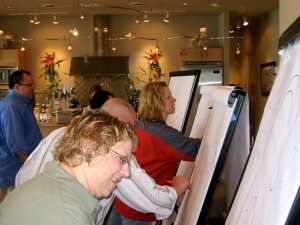 And Chris’s dynamic creativity trainings helped us build a strong team, ready to execute. Our investment with SparkFire has paid lasting dividends. I have no doubt that Nunn Design is a leader in our market due to the work we’ve done with SparkFire. — President, Nunn Design Inc.